Triton's MCTD trailer is an all aluminum frame and deck. 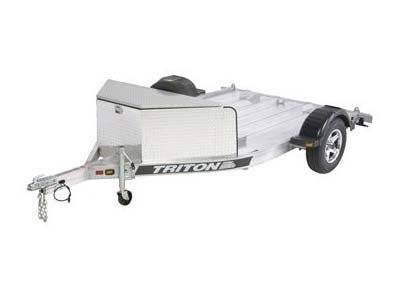 This trailer comes loaded with many of Triton's standard features. Some of the standard features are aluminum rims with radial tires, aluminum diamond plate stone guard / storage box, wheel chocks for cycles, swivel tongue jack, and multiple full length tie down channels. Triton also offers accessories you can add to your MCTD to fit your hauling needs. You will make everyones head turn when you haul your cycle with Triton's MCTD.